The largest port facility on the island, is situated in the western part of Limassol town This New Port is 3 km from the center (the old port) of Limassol. Bus 30 goes to the old port as do also the (usually free) shuttles. You can also walk (30 min) but it is not an interesting itinerary. The new Cruise Terminal Building: Area 3.500 sq.m. Facilities - duty-free shops, banks, tourist information counter, lounge/cafeteria, international telephone exchange, separate halls for departures and arrivals, ship - terminal transfers, taxi service. A very luxurious marina is being developed here. The old harbor, situated near Limassol castle, is now used by fishing boats and pleasure craft. 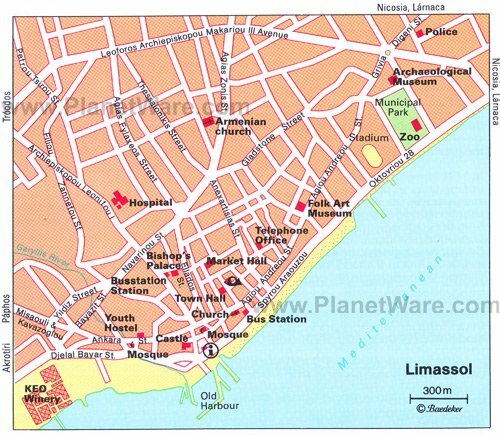 The south coast town of Limassol (Lemesos) is the island's largest seaside resort. Acting as a magnificent backdrop to the city that spreads for ten miles along the coast are the Troodos mountains, in whose fertile foothills most of the country's grapes are grown. Since the Middle Ages when the Crusaders heid Cyprus under Richard the Lionheart, Limassol has been known to traders for its wine and sugar cane. Now, this second largest city of Cyprus, with a population of 135.000 is the center of its wine-making industry, and an important commercial and tourist center. The town's carefree holiday atmosphere, with wide seafront promenade and bustling little shopping streets, is matched by the gaiety and lively character of its people. With its fun-loving reputation and the best nightlife on the island it is fitting that only Limassol stages some of the Island s best-known festivals: the annual Wine Festival in September, when the various wineries offer free samples of their products for ten days: the ten day pre-Lenten Carnival with masquerade parties balls and grand parades, the Limassol Festival in summer and the ancient Drama Festival at Kourion. The beautiful Ladies Mile beach is located near the New Limassol Port and is only a 10-15 minute drive from Limassol Town center. Here you can walk along the golden sandy beach, swim in the crystal calm waters or even have a go on the water sports facilities. The water here is shallow and very clear, so it's safe for kids, and the sand runs for miles so if you'd prefer some peace and quiet you will be sure to find it here. Ladies Mile beach is one of the most popular windsurfing spots on the island due to its flat shallow water. There is a tourist office at the port (Tourist information office offering a service to visitors arriving on passenger boats into Limassol harbor. open every morning except Sunday and also on Monday, Tuesday, Thursday and Friday afternoons) and at Spyrou Araouzou. The most popular excursions: visit the sites of the Curium amphitheater and the sanctuary of Apollo, the Crusader castle at Kolossi and the House of Dionysus at Paphos. Self-drive is enormously popular, from cars and quad bikes to mopeds, bicycles and dune buggies. Driving is on the left. Buses are available outside the port terminal for Limassol city and other cities in Cyprus. The transurban service-taxis are shared taxis connecting all main towns (only during day time) . Taxis are cheap and a good way to travel around the island. Nicosia: The ancient and walled city of Nicosia was split in half after the Turkish invasion of 1974 and until the last decade passage between the two halves was not something a tourist could do. But recent changes now allow fairly easy passage. Lefkara lace is a good buy and is famous throughout the world as one of the products most closely associated with Cypriot workmanship; the name originates from the village Lefkara, situated on a hill on the Nicosia-Limassol road. Saripolou, in the old district near the town hall. # 6am–3pm Mon–Sat. The Central Market, housed in a graceful arcaded building dating from the British era in the early 20th century, is a great place to shop for handmade reed baskets, olive oil, loukoumia (Cyprus delight) and other Cypriot delicacies, as well as fruit, vegetables, cheeses and meats. Language: Greek, Turkish, English widely spoken. Today, some 40% of the population of Limassol are Russian-speaking.